Regulators may raise catch limits on the voracious little shark, which competes with more valuable ocean species for food. Dogfish, a voracious little shark that hunts in packs and fills its belly with anything it finds, now has so little value in the global marketplace that many fishermen who net them just throw them overboard. And here’s the problem: Scientists say there are huge and growing numbers of dogfish in the Gulf of Maine competing for the same food as more commercially valuable species, such as cod and haddock. THE SHARK’S NAME comes from the way it hunts – in dog-like packs – attacking smaller fish, including cod. IN THE GULF OF MAINE scientists estimate spawning dogfish outnumber spawning cod by a ratio of 23 to 1. DEMAND FOR DOGFISH IN EUROPE SOARED in the 1980s when the British began using it in fish and chips. Then catch limits were imposed and they turned to other fish. There has never been a market for dogfish in the U.S. He said there are an estimated 230,000 metric tons of spawning dogfish – females of reproductive age – in the Gulf of Maine, compared with only 10,000 metric tons of spawning cod. That’s a 23-to-1 ratio. Dogfish clog up fishing nets and damage gear, and fishermen are jabbed and poked by their teeth and pointy spines as they throw them back into the sea, said Rob Odlin, a Scarborough fisherman. Two trends are moving in opposite directions: The species’ population is increasing while its commercial value is falling. Fishermen are paid around 14 cents a pound for them. The fish, which grow to more than 3 feet in length, are found in seas around the world. On the East Coast of the United States, they spend their winters in the warmer coastal waters between southern New England and North Carolina. In the summer, they migrate to the cooler waters in the Gulf of Maine and farther north. There has never been a domestic market for dogfish, although Europeans eat them in various ways. The British fry them for fish and chips, and the Germans smoke them. Asians put their fins in soups. The meat is edible but not as tasty as more valuable fish, like cod, said James Armstrong, who manages the dogfish management plan for the Mid-Atlantic Fishery Management Council. 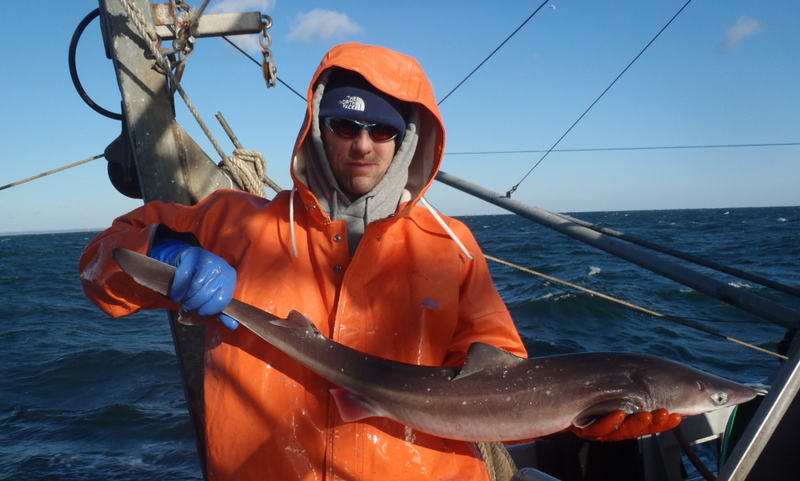 Fishermen in New England began to target the fish in the mid-1980s as more traditional groundfish stocks declined and as European markets opened because of a rapid decline of their dogfish stocks. The British at that time began using the shark’s bland-tasting white meat as a replacement for cod in fish-and-chips dinners. From 1987 to 1996, harvests in the United States increased nearly tenfold, and there were a half-dozen companies in Portland processing dogfish. By 1998, scientists found the spiny dogfish stock had fallen below the minimum level determined to be sustainable, and imposed strict annual catch limits to help the stocks recover. In Maine, the dogfish catch peaked in 1990 when fishermen landed 6.4 million pounds. In 2013, just over 100,000 pounds were landed. The Portland processors all either shut down or moved to other ports, said Walter Barrett, general manager at Seatrade International Co. of Portsmouh., N.H., one of only three companies in the U.S. that processes dogfish. In response to the growing population, federal regulators last year increased the quota from 41 million to 50 million pounds annually for the fisheries in New England and the mid-Atlantic region, with a maximum possession limit of 4,000 pounds per fishing trip. 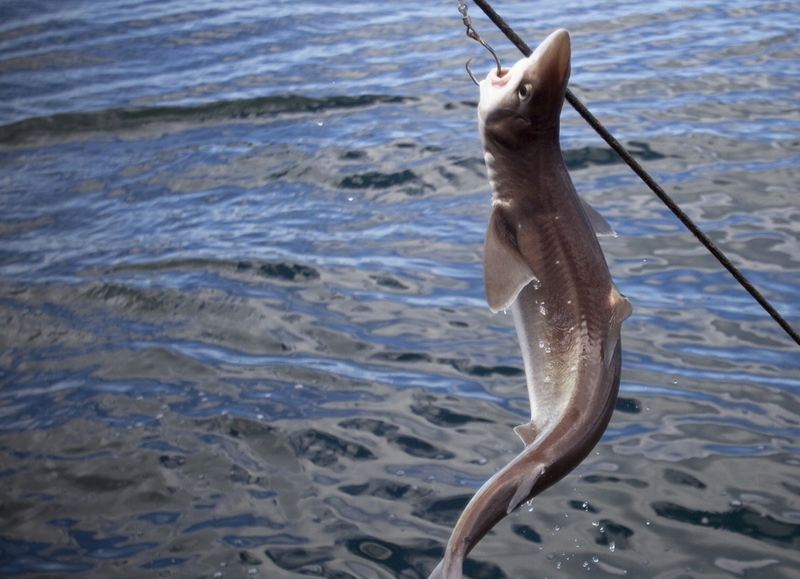 Although there are plenty of dogfish for fishermen to catch, the demand for dogfish in Europe has collapsed because the Europeans have replaced dogfish on the menu with other fish, Barrett said. “We lost the market,” he said. Another problem is that Europeans say dogfish from the United States have elevated levels of polychlorobiphenyl, a chemical associated with industrial contamination. In late August of last year, German authorities denied the import of more than 18 tons of frozen dogfish from the United States. By U.S. standards, however, dogfish are safe to eat. With the growing numbers of dogfish in coastal U.S. waters, federal regulators are now looking for input as they put together fishing regulations for the 2014 and 2015 seasons. The Mid Atlantic Fishery Management Council wants to maintain the 4,000-pound-per-trip limits, but the New England Fishery Management Council wants to eliminate trip limits altogether. Odlin, the Scarborough fisherman, said dogfish aren’t worth the effort to catch them when fishermen can’t keep more than 4,000 pounds a trip. He said higher catch limits per trip would make it more worthwhile to catch them. Bert Jongerden, general manager at the Portland Fish Exchange, said he’d like to develop a domestic market for dogfish, which he describes as “wicked cheap protein.” Last year, he gave some dogfish to the chefs who prepare lunches for the students in Portland’s public schools. He said he never heard back from them.